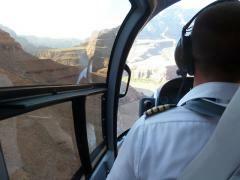 Take a helicopter tour to the bottom of the Grand Canyon! Extend the tour in Las Vegas! 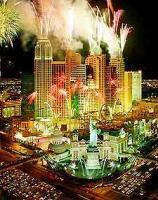 You will be dropped off at your hotel, or one that is next to it or across the road, and are free for the rest of the day and night, to explore the Strip and check out the lights and action. Day 2 - Early start today! 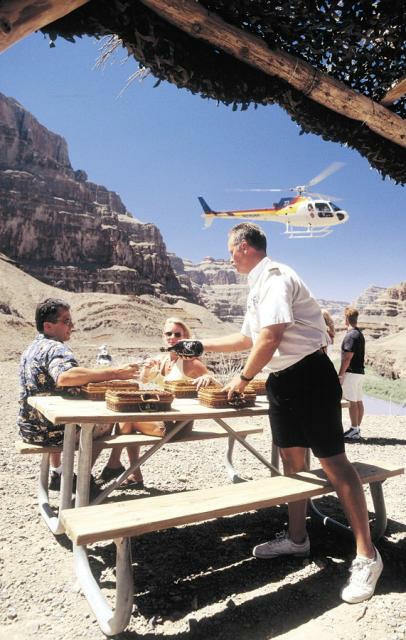 The Grand Canyon helicopter tour generally takes off at about 7 a.m., which means a pick up at your hotel at about 5.30 a.m.
Day 2 - Helicopter to the bottom of the Grand Canyon! 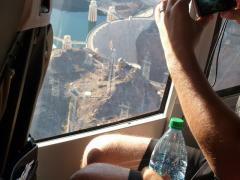 A helicopter flight is really the best way to see the Grand Canyon, if you only have a short time to do so. This is especially true on a tour that flies beneath the rim, and lands right at the bottom of the Canyon! All seats provide a great view as you take off, soaring first over Lake Mead and Hoover Dam, before heading for the Grand Canyon, on a flight that lasts approximately half an hour. As you near the Canyon you will enjoy spectacular vistas of the extinct volcanoes of the Black Mountains, before flying over Grapevine Mesa and then across the Grand Wash Cliffs, after which you enter the Canyon itself. 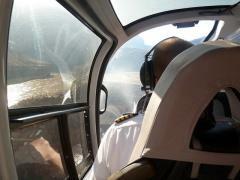 The views are both beautiful and awe inspiring as you descend below the rims and fly between the Canyon walls. 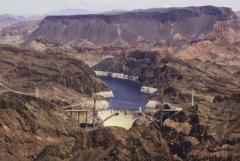 You will step back in time as you descend 4000 feet into the depths of the Grand Canyon, before landing next to the historic Colorado River. 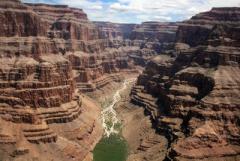 Day 2 - Eat at the bottom of the Grand Canyon! You have half an hour to sit and enjoy a light meal served under an authentic Hualapai Indian shelter called a Ramada, before briefly exploring the pristine Hualapai tribal land. Take some pictures, stroll around, and enjoy the sensation of experiencing what so few people have done, before the half hour flight back to Vegas. As you will notice from the itinerary, today's trip is unescorted. What this means is that there is no tour guide on the bus, only the driver. Day 2 - Save time! Fly to LA instead! Instead of taking a bus from Las Vegas to Los Angeles, you may prefer to fly. If you would rather go by plane, please order that option when you check out. If you do decide to fly rather than taking the bus, your tour will end at the Los Angeles airport. Please note that the price quoted for this option assumes that you book sufficiently far in advance. 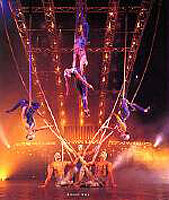 If you do not, or if it is a holiday, convention or other busy time in Vegas, the price may be higher. Fridays, Saturdays and Sundays are often $10 to $25 more expensive. We will always let you know ahead of time if that is the case, before charging your card. Note that we use an airline that does not charge a checked luggage fee. 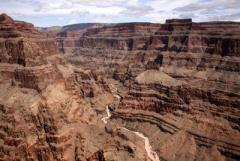 The entry fee to the Grand Canyon is included. One night's accommodation is included at a minimum three star hotel on the famous Strip. If this falls over a weekend, convention or holiday period, a higher price may apply. Please advise if there will not be at least one person 21 or older in each room as only a few hotels in Vegas allow this. Prices are based on double occupancy. Single, triple and quad rates are also available and will be seen at check out. There are no taxes. As noted above, you will need to pay the Las Vegas hotel resort fee when you check in. A light meal is included at the Grand Canyon. Portions of this tour are subcontracted to other reputable vendors. The tour drops off at the places detailed above. Payment And Cancellation Details: You may cancel this booking any time up until 45 days prior to the start of the tour, and you will get a full refund. After that time, we will not accept a cancellation and you will have to pay for the tour in full. Please consider purchasing trip insurance as our cancellation policy is strictly enforced, regardless of the reason for canceling. Half the cost of the tour will be charged to your card any time from 45 days prior to the start of the tour, and the balance will be charged any time from 10 days prior to the start of the tour.